I have already written about smoking and drinking, but realized that there are several facts about alcohol—potentially helpful to writers—that I omitted heretofore. Other factors are so crucial to reality that I’ve repeated them here. When writing realistic drinking scenes, be aware of factors that affect the effects of alcohol. You probably know that eating—particularly fatty foods—slows the metabolism of alcohol and thus one gets high faster on an empty stomach. (I once read that ancient Romans drank straight olive oil to increase their tolerance before big feasts. Just saying.) You may also know that people who drink regularly and heavily have a higher tolerance. 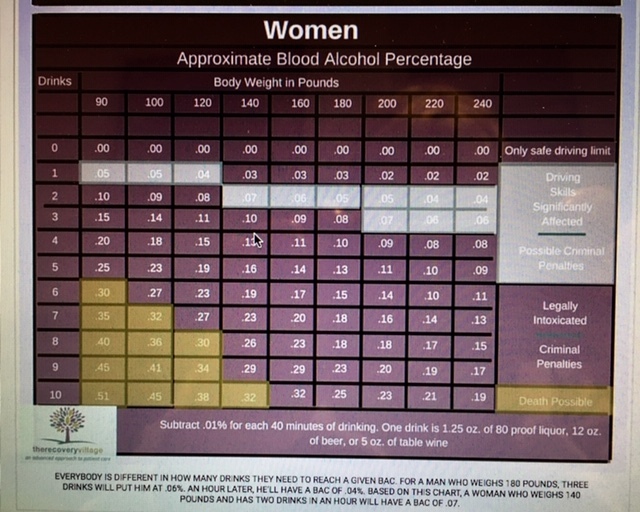 But regardless of anything else—as these two charts show—weight and gender are huge factors in alcohol effects. 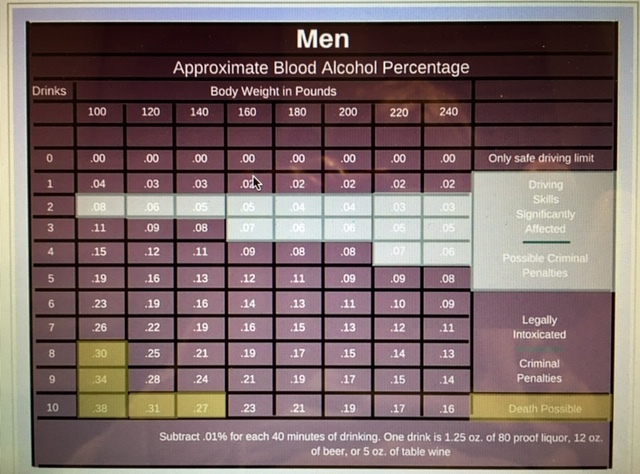 Causes of gender differences: Besides weighing more in general, the male body tends to have more water to dilute alcohol. Also, women have significantly less of the enzyme that breaks down alcohol in the stomach. Bottom line: Even when controlling for weight, women get drunk faster and stay drunk longer than men. A normal, healthy liver can process approximately one drink per hour. To put it another way, one drink of alcohol stays in your blood approximately one hour. More than that, and it takes proportionately longer to get clear. Alcohol stays in your urine about 80 hours. Alcohol stays in your hair follicles approximately three months. Alcohol can be detected on the breath as long as there is alcohol in the system. E.g., with a blood alcohol of .20, that would be approximately 13 hours. Using the EtG test, one beer was detectable 16 hours later; six shots of vodka taken in 3 hours was detectable 54 hours later. Important note: this is the most sensitive test to detect whether a person has had alcohol. It does not detect drunkenness, which can have passed off during the intervening hours. So, consider those factors when your are writing about alcohol testing, e.g. for a job application or entrance into a treatment program. Short answer: it depends on how much you’ve had to drink. (See above.) In many states, a blood alcohol concentration (BAC) of .10 means that 1% of your bloodstream is alcohol—and therefore drunk. Writers: Be sure to confirm the level for legally drunk in the locale of your story. More technical answer: most alcohol metabolism depends on the liver, which takes one hour to metabolize 1.0 to 1.5 ounces of alcohol (depending on study cited). 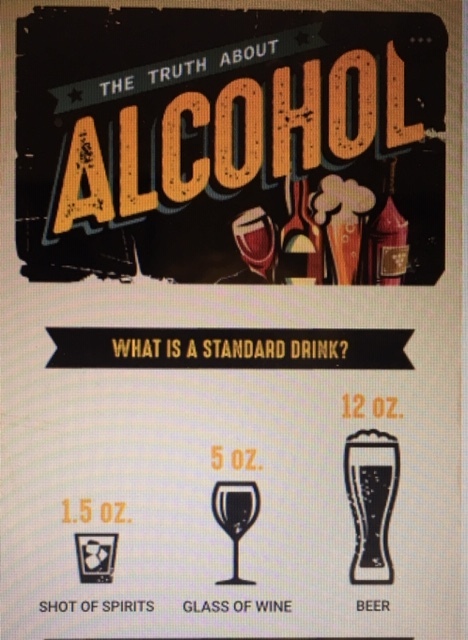 If one ounce of alcohol produces a blood alcohol concentration of .015 will have no alcohol in his/her system after 10 hours. The healthy, average liver metabolizes alcohol at a constant rate. Given the frequency of use for pain, over-the-counter NSAIDS (non-steroidal anti-inflamatory drugs) deserve special mention. 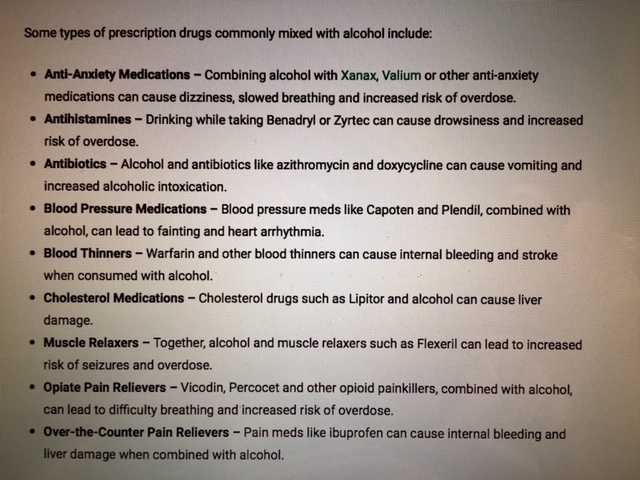 According to my reading, Tylenol is the worst because it can cause severe liver damage from regular doses that are taken when drinking alcohol daily. Others are more likely to cause internal bleeding, ulcers, etc., which (in my opinion) would be likely to be detected sooner. You can find many self-tests online that would give you thoughts and/or worries for your character. 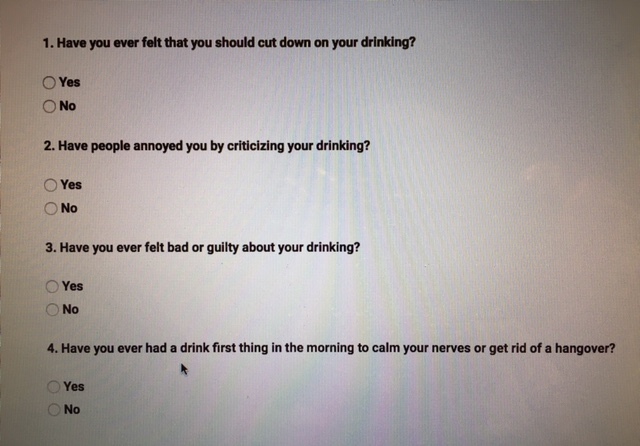 Answers to the four questions on the CAGE assessment identifies 9 out of 10 alcoholics! 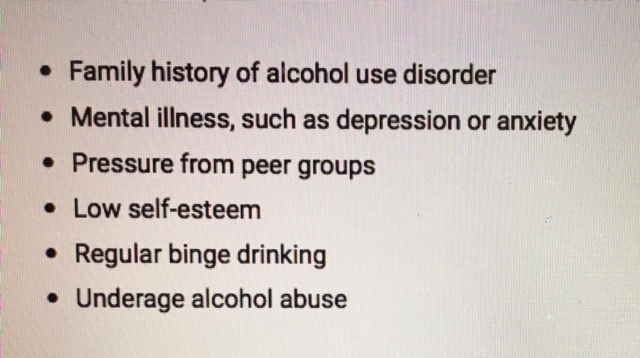 Other resources include the MAST Alcohol Assessment Quiz, which comes in various lengths, and the 10-multiple-choice-question AUDIT Alcohol Assessment Quiz. If the drinker is the POV character, these might be private concerns. If not, perhaps the character talks about these concerns with others. Realistically, which characters are most likely to be problem drinkers? Bottom line: I’ve tried to provide helpful info for realistic writing. Did I succeed?